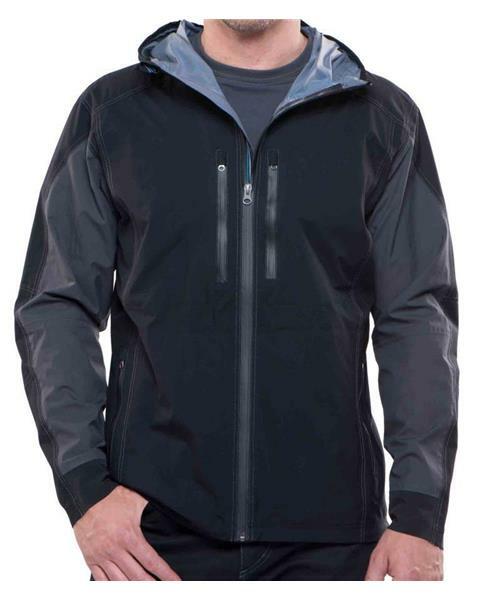 The Kuhl Jetsream™ jacket is a lightweight, high performance rain jacket made with Airskape™ fabric. This ultra-high performance waterproof/breathable fabric boasts a 20K waterproof rating, 16K water vapor transportation, and a 2.5 layer 15 micron thick blue pearl finish. The Jetstream features Kuhl's 5-panel articulated sleeves for better range of motion, as well as an ergonomically, anatomically correct pattern to follow the contours of your body. The low profile, stretch cuffs seal out cold and wet. Kuhl's signature hood has a reinforced brim and clean and sleek eye-lock for low profile adjustment. Custom Kuhl reflective ribbon at the inside draft flap and pockets provides better nighttime visibility.